The next day, Yuzuki heads to the high school, nervous about whether she had passed the entrance exam. So she’s really happy when she finds her number on the board posting the list of accepted students. However, she is soon confused when she hears another girl exclaim that her number 1215 is up on the board, which can’t be right since 1215 is Yuzuki’s number. Or it would be if the girl didn’t show her own slip with the number 1215, or if Yuzuki could have found her own entrance exam slip on her or anywhere at home when she searches it in panic. Incidentally, the handprints in the drawer seen while Yuzuki searched her home caught my attention: I might be over-extrapolating that it might imply something dark about Yuzuki’s past, along with other things that were dredged up in the home and Yuzuki’s unreachable mother. Outside, a couple of women talk about no one living in the apartment building Yuzuki lives in anymore and that it might finally be demolished. So they’re puzzled by Yuzuki who says that she’s living in the building, when they find her searching the trash for her entrance exam slip. Yuzuki doesn’t notice anything amiss about her fragile identity at this point, but she definitely does notice something very wrong when she gets to school in search of her missing entrance exam slip. None of her classmates recognizes Yuzuki, but she finally realizes what’s happening when her teacher does not recognize her, which is confirmed when her name is not on the class attendance list. Things take a surreal turn when she tries to approach her three closest friends she notices outside the teachers’ office, who aren’t there when she runs out of the room. Now Yuzuki has a much more important issue than her missing entrance exam slip: everyone seems to have no idea who she is, no matter how much she asks around. Despondent, Yuzuki walks to the school gate to leave the school, which is where she sees Akie. But Akie disappears in front of her eyes, only to appear behind her and accuse her for not helping, and then disappearing again. This must be incredibly frightening to Yuzuki, and she calls out to Ai to show up and loudly reaffirms her intention to never become the Jigoku Shoujo. I don’t think it’s the doing of Ai or her assistants, however. Although the Jigoku Tsushin members are content to remain watching, there is still someone who remembers Yuzuki and approaches her in her grief: Tsugumi. It’s somewhat of a relief for Yuzuki that at least someone other than the Jigoku Tsushin knows who she is. But when Yuzuki asks how Tsugumi escaped from the fate of becoming the Jigoku Shoujo, Tsugumi makes it quite clear that she was never meant to be the Jigoku Shoujo, not surprising since there was never any such indication and with how Ai was more focused on revenge against Tsugumi and Hajime in the first season rather than any inclination to prepare her successor. Tsugumi has seen so many people sending people to hell and being sent to hell, and for some odd reason, mentions Yuzuki as part of a separate category she has also watched. Tsugumi believes that it is her destiny to be a passive observer for the Jigoku Tsushin, although Yuzuki tries to convince her to help by pointing out the time when she did something other than just observe, when Tsugumi stopped Yuzuki from going through the gate to hell in episode 13. After taking Yuzuki to her home, Tsugumi reveals more things she knows about the Jigoku Tsushin. We learn how her father eventually gave up trying to stop the Jigoku Tsushin when he finally realized that what he was doing was part of the Jigoku Tsushin system itself. Tsugumi thinks that the reason that she is sent the visions is to make her give up and accept the unjust and contradictory nature of the world as it is, where people actually want the world to be the way it is secretly, and that whatever is sending her the visions wants to maintain this order. Mentioning how some clients of the Jigoku Tsushin were saved, she uses this as a starting point to talk about how these people weren’t the target demographic for the Jigoku Tsushin. She believes the Jigoku Tsushin is supposed to save the people who don’t end up using it, who derive comfort from its very existence by having the thought of being able to send someone they really hate to hell if things get really bad. Given how the Jigoku Tsushin seems to be inextricably linked to the mess that is the world, and with no idea of how to even start fixing things, Hajime gave up trying to stop the Jigoku Tsushin, and Tsugumi herselve eventually gave up and accepted its existence. In fact, Tsugumi believes that the same is true for Ai. But Yuzuki can’t accept their approach: even simply attempting to ignore what was happening with the Jigoku Tsushin was too painful, actively accepting what they do may be too much. Yuzuki tries to convince Tsugumi that she hasn’t really given up, again talking about how she had stopped Yuzuki from going through the gates of hell and how Tsugumi came to live in Saigawara City where the Jigoku Tsushin resumed their activities. In response, Tsugumi talks about how passionate her father was in his quest, and how disappointed she was with him when he gave up, only to come around to his point of view when she grew up. It was simply too exhausting for both of them. It’s no surprise: I think their attempts to stop Ai doing her Jigoku Shoujo duties were futile considering that it was probably not something Ai herself wanted in the first place. Much of what Tsugumi says is just her own theories, but given her experiences with the Jigoku Tsushin, I think that much of what she believes is true. When Yuzuki asks Tsugumi for advice on what she should do, Tsugumi tries to make Yuzuki promise that she would not pass through the gate to hell. Yuzuki obviously wants to know what’s actually beyond the gate, so Tsugumi tries to prepare Yuzuki to accept whatever terrible truth there might be. For Yuzuki, it is a terrible truth indeed. Tsugumi had watched other girls who were meant to become the next Jigoku Shoujo, but they did not become one nor did they accept their fate and are wandering between life and death even now. She talks about how they could try to deceive themselves into believing that things could go back to the way they were by building an illusion of a normal life with parents and school. And Tsugumi finally clues Yuzuki into the truth that the world without Yuzuki is the real world, that the one she had lived in was an illusion, and that Yuzuki was in fact dead. Yuzuki simply cannot accept what Tsugumi is saying, despite Tsugumi’s attempt to prepare her emotionally and subsequent attempt to make her accept the truth and hold strong. As she runs through the streets to her home, she doesn’t notice that no one sees her even when she runs right in front of them. But she definitely cannot help but notice the ruins that is her home, not to mention her own skeletal body lying dead in her room as confirmed by Ai. This was an incredible episode, which is all the more impressive considering that I expected half of what was generally going to happen. Some of Tsugumi’s dialogue was confusing, though, with how she segues into other subjects without expounding on the previous topic, such as when she started talking about how she thinks her visions are meant to make her give up in her attempts to stop the Jigoku Tsushin after talking about how Hajime gave up in his own attempts after realizing that his attempts were all part of the system, without expounding on how he realized it or how it’s part of the system. But she is very adamant about Yuzuki not going through the gate to hell: Tsugumi may have not given up entirely, and perhaps Yuzuki passing through the gate is supposed to be what makes her the Jigoku Shoujo. Now faced with almost incontrovertible proof that she is no longer among the living, unless she somehow convinces herself that it’s just an illusion cast by Ai, Yuzuki is probably going to remember what had really happened in the past. And I suspect her mother to be more than just a hint that Yuzuki’s life was slipping away and an integral part of the tragic event in the past that ended up with Yuzuki dead, and I have a feeling that Akie is also an important part of it. Akie accusing Yuzuki of not helping her in the middle of the episode might not have been about Akie having been sent to hell: it may have been about Yuzuki not having helped Akie in the past. I still have no clue as to what Ai is trying to accomplish. Is she trying to subvert the Jigoku Tsushin system by influencing Yuzuki into doing something that she cannot bring herself to do, taking another approach than the one Hajime and Tsugumi attempted? Or is she simply trying to activate the next Jigoku Shoujo just so she doesn’t have to be the fallback Jigoku Shoujo by default? Or more likely, something that I have not thought of at all? Whoa! I’ve never been so glad I was so wrong. And it is 50% your call so far! So she is indeed a dead girl deluding herself into a normal life. I still hope she escapes this without becoming a Hell Girl or a lost spirit though. 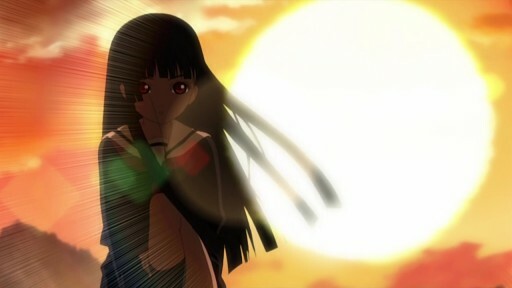 If other girls did escape, even if it is into nothingness, then the Jigoku Shoujo destiny can’t be so absolute, can it? Plus I’d like to think that if the same thing has repeated before, this would be a story about how things went different for one of the girls (ending lyrics). Say, I read this elsewhere, but what do you think about Hajime being alive still, maybe as the homeless guy from episode 14? I’ve been hearing a couple ramblings about it. About the homeless old man from episode 14 being Hajime: I think it’s a stretch with the supporting evidence being very tenuous (nothing more than him being about the right age and not being around Tsugumi), but it would fit. I suspect Yuzuki was disappearing and by this point now gone from everyone’s mind but never have I thought she was already dead. Next episode would explain everything and I do believe her mother may be a part of it but also she might had some rumor of being a ‘devil’ child like Ai due to getting strange looks by the children and being alone in most of the preview. How she die makes me wonder? How can Akie fit in all this? This is a crazy thought, but Akie might be Yuzuki’s Sentarou, the only friend Yuzuki had who didn’t help when she died. Yuzuki died about the same age that Ai was MEANT to die, i.e. 7 years old. Her current age is about the same as Ai, so I guess it’s about right? There’s another theory that Hajime was sent to hell by the person that Tsugumi was running to stop a few eps back (Yuzuki’s vision). Darn, for some reason I remembered Ai being about 10 years old when she died and having been hidden by Sentarou for only a few months at most. :/ Totally wrong, and the correct ages do match up too well. It wasn’t very nice move. I don’t remember significant hints about Yuzuki’s death in previous chapters. Why Ai’s team couldn’t understand what this girl is dead? It means what Ai’s men also can’t break the illusion? Maybe Yuzuki is really strong with her supernatural powers, enough to make her worthy of being a Jigoku Shoujo, which is why Ai’s assistants wouldn’t have a chance piercing the illusion. If Yuzuki is in fact dead, then what about the people being sent to hell from the start of Mitsuganae up til now? Was it all an illusion? Or did it actually happen? If so, how could Yuzuki have had conversations with Ai’s clients? I think it all actually happened, but I’m not sure how people remember events that Yuzuki have influenced. There’s not much difference for the Jigoku Tsushin jobs as they still happened despite Yuzuki’s efforts. The only one that is possibly different is with Mayama Azusa and Akia: Azusa might have originally planned to send the father to hell. This is why I’m really interested in seeing how Azusa remembers the events (assuming we get to see her again). If Yuzuki has been dead all along, how did she grow up to be a teenager? It was all an illusion by Yuzuki with her desire to live a normal life. It might have been her potential to be a Jigoku Shoujo that let her spirit make everyone around her think she existed. I’m not sure how long it’s been going on: while it may have started since she died, I think it’s been less than a year. On the other hand, it is possible that Yuzuki has been deluding herself the whole time without affecting the perceptions of anyone alive, although I don’t consider this likely. For one thing, Ai’s assistants didn’t seem to have a clue about Yuzuki’s nature at first, not to mention Ai having used Yuzuki to manifest herself in the real world. Did Tsugumi ever disappear from the world like Yuzuki did? And if she did, how did she build a new life for herself? I always wondered, I guess Ai really hates what she does, but how could you tell? I mean, she’s pretty emotionless but are there any instances where she shows how much she hates being Jigoku Shoujo? Sorry for the stupid question, I just needed to know. I don’t think she ever comes out and says it directly, but her fatalistic attitude towards her job makes it pretty clear. It’s made even more clear in the final episode. I’d say the end of Futakomori was also a good indication of what she thought of about being the Jigoku Shoujo.